In Chap. 8 we formalized the MDS structure of micronuclear and intermediate genes through legal strings. In this chapter we shall formalize the gene assembly process in the framework of legal strings. Thus, we shall now formalize the three molecular operations ld, hi, and dlad as operations on (rewriting rules for) legal strings, obtaining string pointer reduction systems. 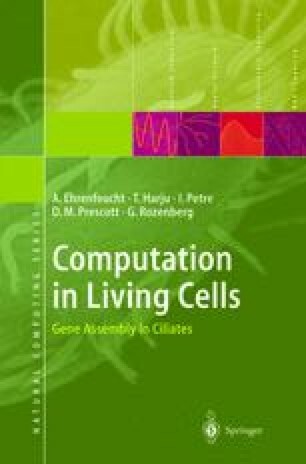 Although the transition from MDS descriptors to legal strings represents an increase in abstraction (we only preserve in legal strings the sequence of pointers), we prove that string pointer reduction systems are equivalent to MDS descriptor pointer reduction systems as far as the strategies for gene assembly are concerned.